Wii U retail version launches June 17 for $29.99. 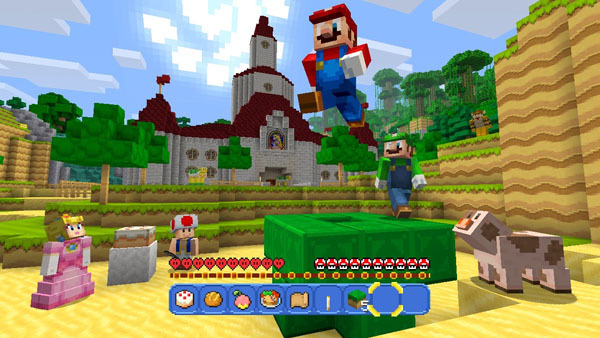 Nintendo is partnering with Mojang and Microsoft to bring Super Mario series-themed character skins, enemies, and a pre-made world to Minecraft: Wii U Edition, the company announced. The “Super Mario Mash-Up Pack” will launch on May 17 as a free game update. It will grant players immediate access to the new skins, a Super Mario-themed pre-made world, and a set of Super Mario-themed music and item textures. Additionally, Nintendo confirmed that the retail version of Minecraft: Wii U Edition will launch on June 17 for $29.99 with the “Super Mario Mash-Up Pack” included on the disc. Watch a trailer for the “Super Mario Mash-Up Pack” below.